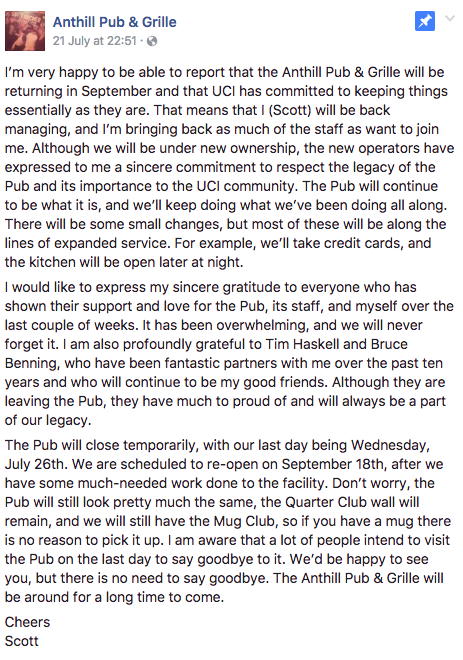 The Anthill Pub & Grille has happily posted on Facebook that they are returning in September. The general manager Scott Winterstein is returning as well as is committed to bringing back as a much of the staff that he can and will join. While they will be under new ownership, the new operators are committed to respecting the legacy of the Pub and its importance to the UCI community. But not everything is remaining as is. Scott also stated that there will be some small changes. This includes taking credit cards and extending the kitchen hours. The Pub is still temporarily closed, with its last day being Wednesday, July 26th. However, they are scheduled to re-open on September 18th after some reconstruction to the facility. But for now, The Anthill Pub & Grille will be around for a long time to come.